Beaver Island as we know it first appeared out of the ice eleven thousand years ago. Since then, its form has changed considerably because of the rise and fall of Lake Michigan, which has ranged over a differential of 375'. The Lake dropped to a very low level about 8,000 years ago, and stayed down for 4,000 years. During this time, this land was not an island at all but an appendage of the mainland. Then the Lake rose to 30' above its present level, submerging all of Beaver except the central plateau. Next, it dropped about ten feet, producing a slightly smaller version of our present Island. The edge of this configuration was layered with beach gravel. When a logging railroad was built in 1904, it was placed on this firm bed. We know that Native Americans passed by Beaver Island as long ago as 2,200 years. There is no proof that they lived here, but the oral tradition of the Odawas, who have resided here for over 300 years, is that there were small fishing villages in many of the bays when they arrived. Arrowheads, spear heads, and fragments of Woodland-period pottery indicate that at least they came ashore. Fire-cracked rocks mark their cooking fires along the bluff. In 1871 the archeologist Henry Gillman opened some of the mounds in the harbor, and was surprised at the "uncommonly skillful workmanship" of the artifacts he found. The Odawas (Ottawas) migrated westward in the ripples of Native American movement that retreated from contact with the whites, arriving on Beaver Island in the mid-1700s. At times they were recruited to help in skirmishes between the English and the French, but little was known about their lives until Father Baraga came from L'Arbre Croche in 1832 to convert the Indians living on the north shore to Catholicism. He baptized 22 Indians, but those living in the settlement near Whiskey Point remained pagan. A few years later, some of the 199 Indians living on Garden Island, 2 miles north (and the site of over 3,000 Indian graves), were converted by other missionaries. White traders and trappers began to appear in the early 1800s. Trapping, fishing, and cutting wood for the passing steamers allowed men to earn a living at this frontier. By the 1840s, two trading posts were flourishing. Economic power shifted here from Mackinac Island because of Beaver's good fishing, ample forests, and vastly superior harbor. In 1850, 100 people lived in a growing community at Whiskey Point, unaware that the few Mormons already present would soon overwhelm them and force them to leave. James Strang, who would create America's only kingdom on Beaver Island, was born in New York in 1813. He expected great things of himself. He established a law practice at the age of 23, but it failed to satisfy his ambition. When he met Joseph Smith in 1844, he converted to his new evangelical religion as a way of improving his position. Strang's debating skills impressed the Mormon leader, who assigned him to found a branch in Burlington, Wisconsin. While Strang was away, Smith was killed. Shortly thereafter Strang produced a letter naming him as Smith's chosen heir. He was challenged by Brigham Young, who was more solidly entrenched. Strang led those who accepted him to Nauvoo, Illinois, and then Voree, Wisconsin, before deciding that God wanted him to bring his flock to Beaver Island. Producing mysterious brass plates from the ground, and receiving directives from God, Strang formed a colony on Beaver Island in 1848. It grew year by year, and soon had the numbers to elect Strang to the state legislature. Trouble with the "gentiles" led to the "War of Whiskey Point", which the Mormons won by firing a canon at the unruly gang gathered at the trading post. By the early 1850s, most of the non-Mormons had left the Island. The ensuing degree of absolute power went to Strang's head, and rumors spread about Mormon attrocities. Strang had himself crowned king, and began taking additional wives. Attempts to oust him by legal means failed, and in 1856 he was assassinated by two disgruntled follow ers. His people were driven off the Island by an unruly mob from Mackinac Island, which was instigated by speculators eager to grab the land. During their 8-year occupancy, the Mormons cleared and cultivated the ground, built roads and houses, and changed the Island from a wilderness to a moderate outpost of civilization. But fate conspired to keep them from reaping the benefits of their toil. Beaver Island was blessed to be near some of the best fishing grounds in the world. The Mormons had excluded the gentiles from partaking in this bounty, but once the Mormons were gone, Irish fishermen began to appear. They came from Gull Island, Mackinac Island, various port cities on the mainland, and County Donegal in Ireland. Once they settled in, they wrote to their families and friends about "America's Emerald Isle." Over the following three decades, the population grew in surges, taking on a decidedly Irish flavor. Ordinary conversations, as well as services in the Catholic Church, were conducted in Gaelic. Of the 881 residents in 1880, there were 141 Gallaghers, 123 Boyles, and 90 O'Donnells recorded in the census. Closely knit, isolated from the rest of the world during the winter, this community developed a unique identity. Because they controlled the nearby fishing grounds, the economy thrived. By the mid 1880s Beaver Island had become the largest supplier of fresh-water fish in the country. But the invention (1872) and proliferation of the steam tug posed a severe threat. Suddenly fishermen from mainland ports could cross to the grounds, lay five miles of nets, and cross back before dark. No sooner had the Island fishermen adjusted to the loss of their monopoly than a second blow befell them: a sudden drastic reduction in the supply of fish, starting in 1886. Due to overfishing, the harvest declined to half its previous rate by 1893. This problem affected the entire Great Lakes. Michigan started a hatcheries program. This helped, but not enough, so in 1897 a law closing the season during the fall spawning period was passed. The Beaver Island fisherman, notoriously independent, announced that this did not apply to them, so in 1898 a warden was dispatched. He leased a boat in Charlevoix and headed for the Island in the first no-fishing week. A fisherman who was out lifting his nets by the light of the moon saw the warden approach. He tried to flee, but the warden, firing on him with a "Winchester cannon," gave chase. Eventually the fisherman's boat was too damaged to continue, and he was caught and arrested and his equipment confiscated. This became known as "the Battle of the Beavers." Islanders' intractability was reduced, but streaks of it could still be observed for the next hundred years. Beaver Island has had more than its share of charismatic personalities, such as Father Peter Gallagher and "Doctor" Protar. Father Gallagher became the Island priest in 1865. A man of the people, he quickly came to dominate Island life. 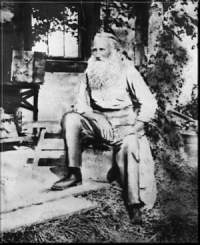 He settled disputes, loaned money, arranged marriages, carried on with the bachelors, acquired vast holdings, owned the merchant ship Hattie Fisher, and became an avid hunter and fisherman. He won a pair of horses in a marksmanship contest, and challenged a man to a fistfight in the St. Ignatius chapel, forcing its closure by drawing blood. When the Bishop tried to have him removed, the Bishop's men were threatened by the priest's flock. He was always a figure of controversy, but was generally respected and loved until he died in 1898. Feodor Protar had almost the opposite temperament. Arriving five years before Father Gallagher's death, this newspaper editor and talented actor wanted to change his life in order to undertake a spiritual quest. He bought an old cabin on Sloptown Road, where he strove for self-sufficiency. He did everything he could for everyone he met, including performing medical services for those too poor or too distant for the doctor in St. James. Despite his objections, he was known as "Doctor Protar." Somewhat of a recluse, and a follower of the precepts of Tolstoy, this elderly immigrant came to be regarded as a saint. When he died in 1925, his admirers built a stone-and-iron tomb on Bonner's Bluff for their "heaven-sent friend." Despite the Island's poor soil, farming played an important role because of the cost of shipping. Farms near Four Corners and on Sloptown Road, many in fields cleared by the Mormons, operated from the 1860s until the 1950s. In addition, excess crops from the Israelite farms on High Island in the 1910s and 20s were sold on the streets of St. James. Logging too has always played a role, with small groups providing cordwood, cedar ties, and tan bark, but in 1901 the Beaver Island Lumber Company went into business in a way that dwarfed all of the other operations before and since. They hired 125 men, bought and built a complex of docks, erected a mill, and built housing on Freesoil Avenue, some of which still stands. They ran a track to Donegal Bay and then south for over ten miles, and had three steam engines hauling carloads of logs to their mill. Ships picked up shaves, shingles, boards, and slabwood and took these products to Detroit and Chicago. The overloaded trains pushed sideways as they rounded the many curves, widening the tracks. Derailments were common. One time a train tipped over, crushing the engineer. Just as some of those who had built the Island's two lighthouses or worked at the Coast Guard station had stayed after their job was done, so too did some of the loggers when the Lumber Company closed its operation and picked up its tracks in 1916. At the turn of the century the population of the Island began to develop more variety. Father Zugelder, the German priest who replaced Father Gallagher, was well-accepted into the diversifying community. Communities on Garden and High reached their zenith before WW II. Churches, schools, sawmills, docks, stores, and homes were built on each of these nearby islands. Native Americans lived and worked in cooperation with the whites. But rising economic pressures made this way of life increasingly more untenable, and both islands were abandoned. Their trails remain, kept open by the DNR, the Game Club, and an abundance of hikers who occasionally come upon an old car, a grove of apple trees, or the rotting remains of a cabin or barn. The improvements being implemented in other communities in the early part of this century came late to Beaver Island. In 1905 the Island was connected to the mainland with a 200-ton telegraph cable. Regular winter mail service was not instituted until 1926; before that, it was dependent on dog- and horse-sled trips across the ice. A power plant was built in 1939, and Island homes finally could have electricity. Previously the Parish Hall, the Beaver Hotel, and the Coast Guard Station had installed their own small generators. Perhaps because of this backwardness, the Island was always a popular destination for those tourists who were willing to rough it in their search for a more pristine lifestyle. Local merchants promoted tourism as early as 1878. Fast-talking developers sold Island lots in the lobbies of Chicago hotels in the early 1900s. Tracts of beach on the Island's east side were turned into lots for vacation cottages in the 1920s and 30s. Despite this boost, the Island's economy was still dependent on commercial fishing. The harbor at St. James was ringed with docks, net sheds, ice houses, and boat-building sheds. When the lamprey eel began to decimate the trout and whitefish population in the 1940s, the Island was in trouble. It had been losing population anyway as the newer generations went off to make their mark in the world, particularly in Chicago, but now almost everyone left. The once-thriving community of well over 1,000 residents dwindled to less than 200, and people were afraid the school and medical center would be closed and they would all have to leave. But in the late 1970s a new wave of tourism reversed this trend. As the economy of Michigan improved, along with the pressure and tension of taking advantage of it, more and more people discovered Beaver Island, fell in love with it, and bought property or a home. Today, construction is the dominant industry, with carpenters as plentiful as fishermen once were. After years of insularity, during which ideas offered by newcomers were sneered at, the Island residents have become much more accepting of notions from outside. The newcomers have helped raise the standard of living, and made life more interesting, Yesterday's backwardness has given way to an enlightened infrastructure, with progressive planning commissions, an active Chamber of Commerce, Historical Society, Preservation Association, Property Owners' Association, volunteer fire department, and a well-trained emergency medical service. And the time-honored tradition of picking up news at the bar has been replaced, to a great extent, by searching the internet. Daily activities have come to closely resemble those of the mainland, with the primary difference being that they are enacted in a distant place that is proud of its unique and variegated natural endowment. Built in 1850 by the followers of King James Jesse Strang, our museum was first used as a print shop. The press and the people are long gone, but the stories of their stay have captured the imagination of many writers and many historians alike. Northern Michigan's first newspaper was published here, as well as religious tracts and Strang's Mormon doctrines. In this Kingdom of St. James, Strang was crowned as King of his people. He ruled their lives and accumulated five wives during his eight-year reign. In 1856 Strang was mortally wounded near the water's edge by two of his former supporters. A special room is assigned to his life and his followers. The Mormons were expelled from the island by a resentful mob which came across the lake to reclaim power over this strategic port, end a dramatic era. The Print Shop is now the general museum for the Beaver Island Historical Society. Besides displaying the story of Strang and his times, it has several other exhibits, some of which are rotated: early Irish life; the Island's musicians; Native American materials; and a new display, "Then and Now", depicting changes to the Island through pairs of matching photographs. Its archives contain much material: "oral history" tapes and transcriptions, diaries, genealogical records, and land records as well as photos. An authentic net shed, built in 1906, houses our growing collection of memorabilia from the days when St. James Harbor was teeming with commercial activity. At one time the water's edge was ringed with vessels of the fishing fleets and commercial traffic, and for many a Great Lakes' captain the harbor was home. The Maine Museum opened in 1980. It tells the story of the busy days in the harbor. Those times included not only fishing, but also the shipping of the products from the mill. Also represented are memories of the disasters which overtook the men and ships of the Island, and the efforts of the Coast Guard and Lighthouse Services which came to the aid of those in distress. In this building you will also find material about shipbuilding, the vessels which have served the Island, and diving activities. Look for information about the other islands in the Beaver archipelago as well. By the waters edge, the Society is restoring a wooden gill-net boat which fished northern waters since 1935. Donations to help the project are sought. Built of hand-hewn logs, this cabin stands in a rural settling and looks as it did when the highly-regarded Doctor Protar lived here, from 1893 until his death in 1925. Descended from prominent educators in Estonia, Feodar Protar migrated to this country in 1874. He traveled, worked on the stage, and edited a successful newspaper for many years before he found Beaver Island -- the place he was to spend the remainder of his years. For the rest of his life, he followed a spiritual quest in a modest environment. He wished to live from the produce of the land and was anxious to help his fellow men. Though he did not claim to be a physician, he found he could cure many of the simpler ailments of his neighbors on the island and earned their gratitude and respect. Protar never accepted money for his services, but instead used his income to help others in times of trouble. When he died, his friends erected a tomb west of his home and its inscription still expresses the sentiments of the population: "to our Heaven-Sent Friend from his people of Beaver Island." The exterior of his home, the grounds and the tomb (1/4 mile west) can be seen by visitors. A special room in the Print Shop Museum is devoted to his life.